Includes mp3 download card and a poster. This is probably the dullest record in my collection. Something has happened to re-master all of the music out of the songs. It's a vacant, hollow, one dimensional sound - a sterile veil wrapped around the music. My original 1998 CD edition is actually much more involving and musical than this 2LP re-issue. I used to have the MOV single LP edition (some say it uses the same stampers as the original Epic release, which are used again on the recent Sony reissue) - which I also found to be a rather flat, airless edition of the songs. I don't usually like it when reviews on here get hopelessly carried away moaning about one specific, trivial observation as though it were the most significant thing that had ever happened in the history of recorded music. But hear me out. I'm a bit bemused that, just like Send Away the Tigers and those peculiar Morrissey reissues, this isn't actually a remaster of the original album but a revisionist new version with an altered tracklisting and zero acknowledgement of the fact. Whatever you think of Prologue to History (personally I can take or leave it), it's *not on* This Is My Truth any more than it's on The Holy Bible. And Nobody Loved You fits perfectly in its original place. 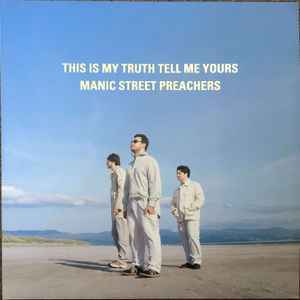 Of course it's the Manics' work to do with as they please, but it's misleading to suggest this version (as they do in the promo materials on the website, on the sticker etc) is the original album 'cause it's just not! Really disappointed with this release. It has surface noise all over sides C and D, and the whole thing sounds muffled. I don't own the MOV reissue but I guess that's the way to go.